We joined host and tech guru Jason Bradbury at the Samsung Unpacked 2013 event in Berlin, where the highly anticipated Galaxy Note 3 and Galaxy Gear were finally unveiled. We went behind the stage to discover all the latest features and find out why this is the beginning of a new era in smart technology and a sure sign that time’s up on the traditional analogue watch. DescriptionWhen you are faced with huge crowds rushing into an auditorium, paparazzi from all corners of the world, and live streams to further crowds in New York’s Time Square, there is an undeniable feeling that something big is about to be announced. Then JK Shin, CEO and President of IT & Mobile Division at Samsung Electronics, walks out onto the stage and he’s holding the new Galaxy Note 3. After the success of the Galaxy Note II, it was no surprise that Samsung would bring out a new and updated version. And it hasn’t disappointed. Even from the first glimpses it was pretty clear that this Note looked a little different. Featuring a beautiful new look, it has a textured back cover, a 5.7” Full HD Super AMOLED screen and selection of colours, including Blush Pink, Classic White and Jet Black. But that’s just scratching the surface. GadgetsBoy from SBTV tells us his initial thoughts. “The new Samsung Galaxy Note 3 is beautiful productivity. It’s thrown in a 2.3 GHz Quad Core processor that’s coupled with a nice 3GB of RAM, as well 3,200 mAh power batter, and all this battery power means if you are watching a HD movie, you get an extra 4 hours of battery life,” GadgetsBoy, SBTV Games & Gadgets presenter said. The team at Samsung has also remarkably found ways of doing even more with the much-loved S Pen. It now comes with the impressive Air Command, which provides a set of five really useful tools, like Pen Window. This is a cool little feature that lets you draw a box of any size onto the screen at any time and then you can easily turn that area into a function you want, like a calculator. This is a personal favourite. Another familiar Note feature to get an upgrade is S Note. It now has a new, friendlier interface and set of features like enhanced writing, editing, and browsing, which together make being disorganised almost impossible. But of course, all these amazing new features were slightly over-shadowed by the announcement of the groundbreaking Galaxy Gear, Samsung’s first ever wearable device. Check out some hands-on SBTV footage of the Galaxy Note 3 from Samsung Unpacked 2013. After wowing the crowds with the Galaxy Note 3, the night stepped up a gear and became more than just a launch. It became a moment when something new, something groundbreaking was unveiled. “The Galaxy Gear feels really smart, and when you’re wearing it as well, it feels really solid and premium, and that’s the sort of thing you want in a watch,” GadgetsBoy said. It really is an innovation that makes you re-think the way you connect and generally live your day-to-day life. From making calls without using your hands via S Voice and capturing photos and video thanks to a camera built into the strap to accessing your apps right there on your wrist, it offers something never seen before. Why would you want a watch that can only tell the time now? Other cool features worth mentioning include the Auto Lock, which basically locks your Galaxy Note 3 when you move more than 1.5 metres from it, and also the Pedometer. This calculates your steps taken, and shows a nice healthy lifestyle application to Galaxy Gear. “What I like most about the Galaxy Gear is that it isn’t just a gadget, with its selection of colours and features it is a fashion statement, which I think is really important, especially if we are to wear it everyday,” GadgetsBoy said. And, last but not least. It tells the time. How smart! It just shows, some things never get old. 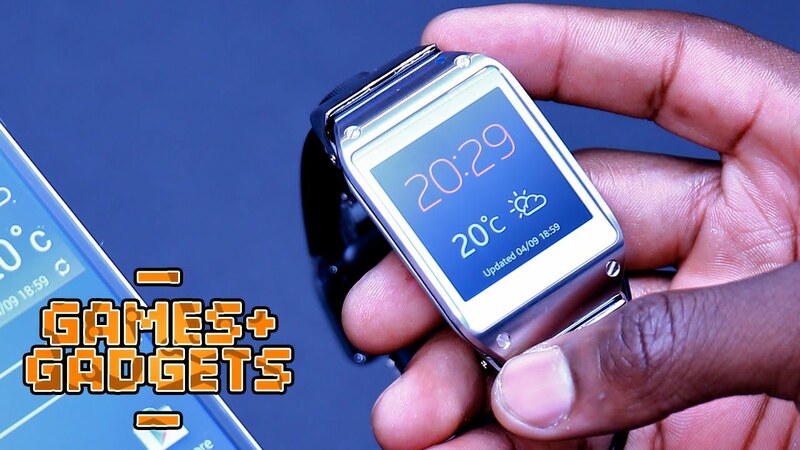 Take a closer look at the Galaxy Gear via some hands-on SBTV footage from Samsung Unpacked 2013. 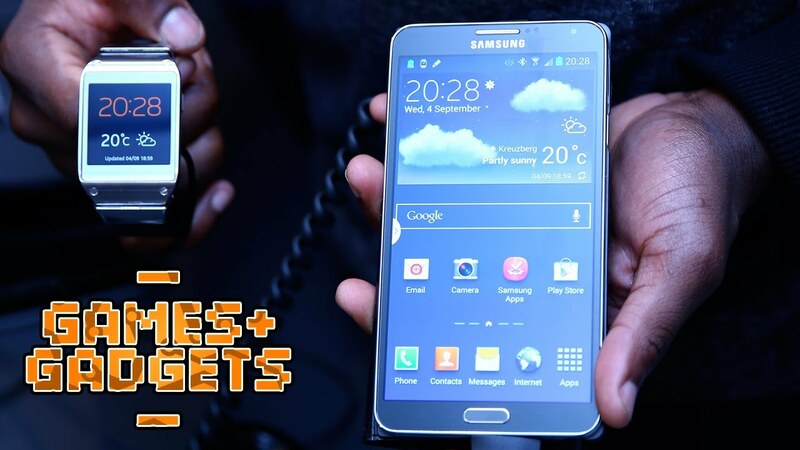 Interested in the Note 3 and Galaxy Gear? For full details on the Galaxy Note 3 and Galaxy Gear, just click the links below. Discover more about how the Note 3’s S Pen and Multi Window can boost your productivity and creativity, as well as great Gear features like Smart Relay and the ability to answer and make calls.